David Mayhew, retired pro-skater, has far from given up his board. Now, he spends his time giving back to the community in addition to co-owning and operating Alumni Skateshop in Madison, WI. In addition to this, David is working with the Madison Skatepark Fund to bring the first public skateboard park to the city of Madison. Growing up in Madison, David had attempted to inspire energy within the city to raise a skate park. Although that dream did not aspire at that time, he did not give up on his goals. After eventually retiring from pro skateboarding, David returned from San Diego, picking up where he left off. That thought uniquely supports the mission of the Portage Family Skate Park as well, with age diversity one of the motivations behind the design of Goodyear Park of Portage, WI. Another common thread? A determined and persevering desire to produce a safe and legal skate park for their communities. According to Madisonskatepark.com, there are more than 2,000 public skate parks across the country, more than five times as many as 1996. With the support seen, partnered with the rising enthusiasm beginning to boil in Madison as well as Portage, it is undeniable that the demand is here. Along with that, comes the demand for skate shops. Because of the increasing attention skateboarding is gaining, Alumni Boardshop is on the verge of expansion. A second shop will be opening in June at 1150 Williamson St. in Madison, directly near the future site of Madison’s own upcoming skate park. A hope that Kyle Little, President of the Portage Family Skate Park Project also holds, to instill a board shop of his own, right in Portage. “I’m an advocate for as many good parks as possible David stated, “Because I never had it. My friends and I would drive to Rockford where they had an indoor park at the time.” That memory is one that fortunately Portage and Madison youth alike will not have to grow with. 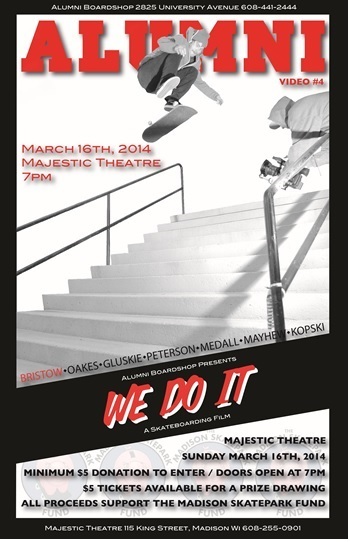 Alumni will be hosting a venue featuring a new skateboarding video premiere at Madison’s Majestic Theatre on Sunday, March 16. “We Do It” is Alumni’s fourth video premier, filmed and edited by the skaters themselves. A $5 minimum donation is requested with additional opportunities to purchase tickets at $5 each for one-of-a-kind and other skate-related memorabilia. Funds are being generously contributed to the MSF. With winter upon us, this is the perfect opportunity to show our support, educate yourself, or merely take in entertainment and be amazed at the talent and athleticisms that skateboarding can offer. You can find out more about Alumni Boardshop (and see their other videos) at Alumniboardshop.com, or by following them on Twitter at @Alumniboardshop. The Portage Family Skate Park wishes to extend a sincere thank you to David Mayhew for his generous time donated to this interview. In addition to his time, David has autographed one of PFSP’s custom boards for an upcoming raffle to show his support and assist in fundraising efforts for Portage’s own skate park (to be announced). For upcoming information on this raffle, check out the PFSP at portageskatepark.org or follow the park on @Portagesk8park or on Facebook.